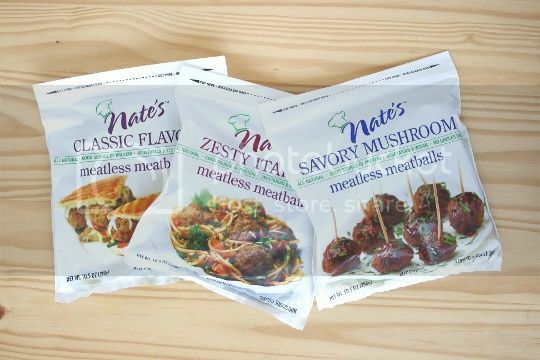 Believe it or not, Nate's has been around since 1999, but they're back with revamped packaging that's sure to catch your eye while strolling through the frozen meat alternative section. They are completely vegan, high in protein, and come in three tasty flavors, with about 20 meatballs in each $4.50 package. What I like about Nate's meatballs is that they are already completely cooked. They are clearly seared on the outside, while remaining chewy and meaty inside. I've had other vegan meatballs that basically fall apart as soon as they're touched, so I definitely appreciate this. In fact, I'd say Nate's has the best texture of all vegan meatballs I've tried. I cooked a package in a cocktail-type sauce (recipes to follow soon! ), and a few of them did start to ever so slightly fall apart. In the future, I'd make sure to just heat them through, about 5 minutes compared to the 10 I did. The secret is to cook these in a thick sauce that will glaze the meatballs, since they're already so flavorful on their own. Still, they performed worlds better than previous varieties I've tried. However if you're looking for an amazing ground beef or ground pork substitute, you may just want to use Nate's and cook them down until they fall apart. 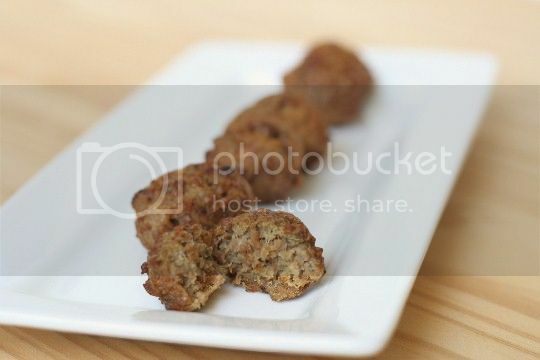 Meatballs or grounds, how versatile! I tried these first, as I figured it would make sense to start with the "original" flavor and then see what the others had to offer. Let me tell you, they did not disappoint. I could eat them plain, they are that good! (Actually, I could eat all of them plain!) They're salty and savory, with lots of parsley flavor. 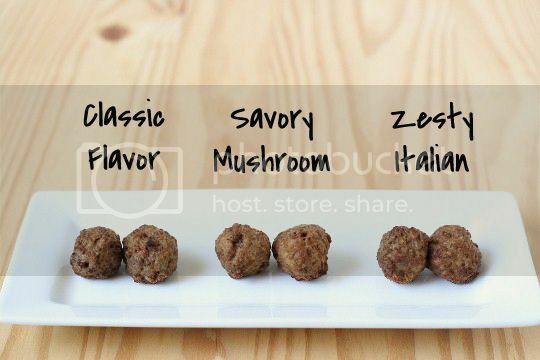 These would be great in any meatball application, as I think they're versatile enough to complement any flavors you pair with them. Surprisingly, these are even more meaty-tasting than the Classic. They have a great earthy flavor reminiscent of mushrooms, yet they don't have an overwhelming mushroom flavor. They seem more salty than that Classic, but their extra meatiness makes them perfect for bold flavors (think Philly cheesesteak-like subs, or anything with beer or sauteed onions). These tasted nothing like what I expected, as I didn't really get an Italian flavor out of them. Interestingly enough, I thought they tasted like breakfast sausage. They are the least salty of the bunch, and have a wonderful sage flavor. I'd actually use these with fruit-based sauces, or maybe even some kind of breakfast sandwich (with some bitter arugula, mmmm), whereas the other two flavors I'd use for typical marinara meatball subs or spaghetti. Try Nate's in your favorite meatball recipes, and you will not be disappointed! Nates also used to make a chicken flavored one that we absolutely loved. Then they simply disappeared from the shelves around 2004 and I have never seen them since. You are absolutely correct though that Nates makes the best vegan meatballs on the market. I totally agree, Nate's are the best. Having grown up in an Italian neighborhood, Nate's meatballs taste like the autentic beef, veal, pork combo meatball. They're moist, flavorful. The other brands taste like beef meatballs - hard like beef & unflavorful. Unfortunately, in Philly, PA - can't find Nate's anymore. Thanks for reviewing Nate's. I haven't ever tasted them, but have been a little disappointed in the vegan/vegetarian meatballs I have tried. A local market has Nate's on their weekly ad, and I wondered about them. With your good review, I'm going to buy some...mmm, now to decide which one to try...maybe I'll buy 2 flavors.